Are you hiding your smile because your teeth aren’t as white as you’d like? Teeth whitening is a simple solution to brighten your smile and it’s done in your own home. When you come in to get your teeth whitening kit, Dr. Cummiskey will first do a quick exam to make sure you are teeth are healthy and there aren’t any that could be damaged by the strong bleaching gel. 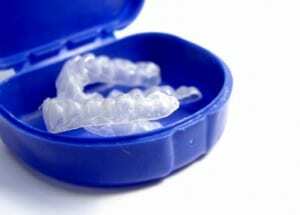 Then an impression is taken of your teeth to make customized trays that will fit your teeth snuggly. When your trays are ready, you take them home with the bleaching gel that we will give you. You put some gel in each tray and wear them for at least 20 minutes a day until your smile is as bright as you’d like. Most people wear them for about two weeks to get the results they are looking for. Whitening your teeth is more effective than over-the-counter tooth whitener toothpastes because it works on the inside of the tooth, not just on the surface. The peroxide in the gel works into the tooth and releases oxygen, which oxidizes stains on the inside. Whitening toothpastes aren’t on the teeth long enough to have the any effect on the tooth color—they will only remove surface stains. Some other over-the-counter whitening products actually roughen the surface of your teeth making them more susceptible to staining. Nothing else whitens as effectively as dentist-supervised teeth whitening. After you have used your teeth whitening kit, your teeth will be whiter than they were originally because all the stains that were inside your teeth have been oxidized. They are permanently gone. But you still have to live and eat, so over time, with fruit juices, coffee, smoking, berries, colas, etc., gradually new stains will come. Your teeth will still be whiter than before, but you may want to “touch up” every year or two to maintain your whiteness. If you are ready for a whiter smile, call our office to schedule an appointment or click here to request an appointment online.